New York Times best-selling author Neil Gaiman’s transcendent series SANDMAN is often hailed as the definitive Vertigo title and one of the finest achievements in graphic storytelling. Gaiman created an unforgettable tale of the forces that exist beyond life and death by weaving ancient mythology, folklore and fairy tales with his own distinct narrative vision. 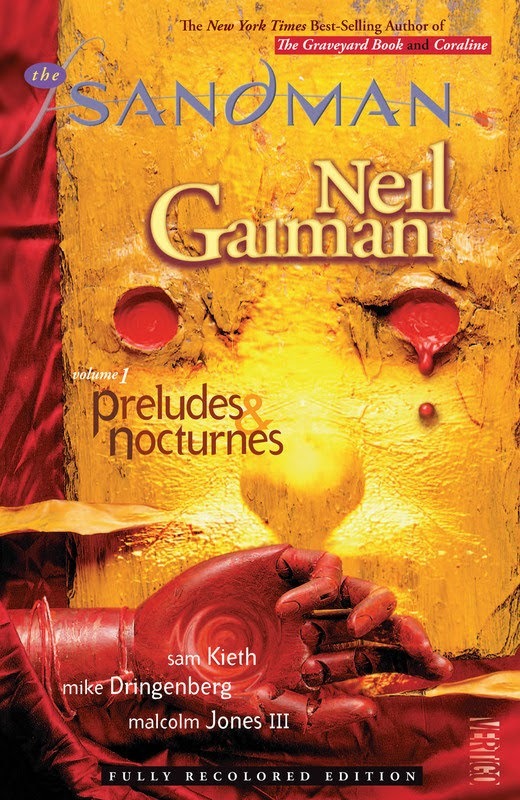 In PRELUDES & NOCTURNES, an occultist attempting to capture Death to bargain for eternal life traps her younger brother Dream instead. After his 70 year imprisonment and eventual escape, Dream, also known as Morpheus while initially infuriated at the death of his mortal jailer inflicts a dire punishment on his son instead turning life into an eternal nightmare , Dream then goes on a quest for his lost objects of power. On his arduous journey Morpheus encounters Lucifer, John Constantine, and an all-powerful madman freshly escaped from arkam asylum who has corrupted one of dreams most powerful items his soul stone. This book also includes the story „The Sound of Her Wings,“ which introduces us to the pragmatic and perky goth girl Death.